Best Colleges, a website dedicated to conducting data driven research about higher education in the United States, published an investigative review of the best online master's in education degree programs available in the US. Also included are valuable resources and guides for students such as financial aid and scholarship information. The Master of Arts in Urban Education program at Rhodes College is a unique, interdisciplinary master’s degree program designed to address the present and growing need for high-impact, culturally relevant educators in diverse urban schools. It provides high achieving students with an educational experience that will enable them to become thought leaders and educators that use contemporary approaches and methodology to impact public urban education. This site provides free tools for current students and continuing learners to develop their careers in education, including career outlooks, program ratings, licensing information, and expert advice. We also provide resources for recent graduates and current teachers such as our guides to earning master's degrees in education and our jobs board, which displays new openings in teaching, administration, and learning support positions every day. This site provides information and resources for pursuing a license in Early Childhood Education. Sarah Stricker ('14) teaches kindergarten in Uncommon Schools in Brooklyn. 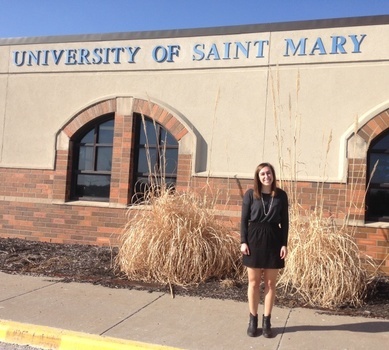 Allison Kirby ('14) pursues her MAT in Kansas City taking evening courses while working during the day in a local school with K-5 students who have behavioral and emotional problems. There are a variety of ways to pursue teaching after graduating from DePauw. Many DePauw Education Studies graduates choose to pursue their teaching license. 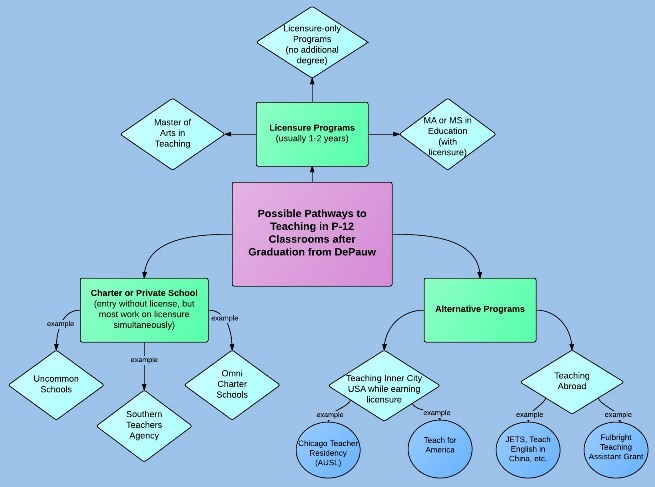 Some students go on to graduate school to get their Master of Arts in Teaching (MAT), while others go into an alternative program in which they work on their MAT or licensure while they fulfill a teaching commitment in an urban school setting. Details of various paths to teaching are outlined below. Obtaining a Master's Degree with licensure provides the double benefit of obtaining an advanced degree as well as a teaching license. Things to consider when choosing a program include time to complete the program, cost, structure, and pre-requisites. There is also the choice of choosing an MAT, M.Ed. or M.S in Ed. For a description of each, please click here. A list of approved teacher education programs by state is provided to the left (as a drop-down menu) to aid in searching for a Master's program. With a Bachelor's Degree, there are programs in which a person can enroll to get a teaching license without earning the full Master's Degree. Transition to Teach programs are one example. For information on Indiana's Approved Transition to Teach programs, click here. Additionally, many universities offer programs that result in licensure but not in a Master's degree. Information on such programs can be found on each university's website. These programs allow a person to teach or assist in a classroom in an urban setting while pursuing a teaching license. The programs provide mentoring and support as well as compensation. There is often a required commitment to teach for a certain length of time. Such programs include Uncommon Schools, AUSL, Urban Teachers, Teach for America, Teach Kentucky, Teaching Fellows, Alliance for Catholic Education Teaching Fellows, and Woodrow Wilson Teaching Fellowship (for secondary science and math teachers). Phalen Leadership Academies is an example of an organization which allows college graduates with no teaching license to work as a teaching assistant as an AmeriCorp Teaching Fellow while pursuing a teaching license. Many charter schools and private schools do not require the same teaching licenses required by public schools. For example, in Indiana, a person may apply for a Charter School License which requires that the person have a Bachelor's Degree along with either a 3.0 GPA or a passing score on the state content area exam. Christel House Academy in Indianapolis is one example. A resource for finding jobs at these types of schools is Southern Teachers Agency, which is a PK-12 teacher recruitment service focusing on private and independent school placements. Teaching overseas is another option for classroom teaching without necessarily having a license. There are a variety of organizations in which a person can pursue international teaching. These are just a few: Teach English in China, Teaching Assistant Program in France, JET Program, AEON, AMITY Institute.